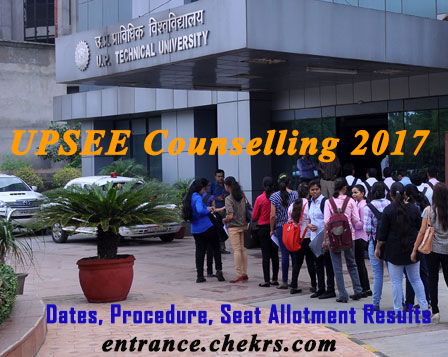 UPSEE Counselling 2018: is going to be conducted by Dr. A.P.J. Abdul Kalam Technical University, Uttar Pradesh, Lucknow.The UPTU Counselling is going to be held soon after the announcement of UPSEE Result 2018. Eligible aspirants who qualify UPSEEE 2018 and make their way into the Merit list will be called for UPSEE Counselling Date 2018, which is going to be held from the last week of June till the first week of August 2018. Therefore UPSEE Counselling Procedure includes a toal of five rounds and a subsequent number of process such as registration, choice filling, fee payment, verification of document etc. For the AKTU admission 2018 candidates must participate in the counselling session as per schedule. In regards to more details, you can refer to the below section. UPSEE Counselling Round 2 will start Soon. Check the date sheet below. Applicants who qualify successfully in UPSEE 2018 will be invited to attend AKTU Counselling 2018 to get enrolled in the Engineering Program of Dr.APJ Abdul Kalam Technical University. Therefore for UPTU B.Tech admission counselling sessio will be carried out to allocate seats to the candidates who qualified the UPSEE 2018 entrance examination successfully. Candidate’s according to their interest can fill as many as choices for colleges and courses. The choice filling process will be conducted through online mode. In order to access the choice filling link, students must login by entering the login credentials. After the choice filling round, applicants must go through the document verification round based on the state rank in UPSEE. Eligible applicants must attend this round or else they will not be further eligible for seat allotment. The Document verification process is conducted at various its counselling centre. After completion of choice filling process, the seat allocation result will be announced. Candidates can therefore, check their allotted seat through the official website of UPSEE. Freeze Option: Candidates satisfied with the seat must opt this option. Float Option: Candidates who want to upgrade the seats in the next round, must use this option. Withdraw Option: Candidates not satisfied with the seat allotted to them can choose this option. However it must be noted that after choosng this option, candidate will be dropped down from the rest of the counselling rounds. Round 1(Main Round): The round will be held in two phases (1 and 2). All the candidates belonging to all the streams and whose rank is in between 1 to 35000, will be invited for seat allocation. Round 2(JEE Main & CMAT Counselling) : In this round, the seats will only be allocated to JEE Main and CMAT qualifiers. Round 3(SC/ST/OBC Candidate)- It is for all SC, ST and OBC candidates. The first to last rank holders will be invited for seat allocation. Round 4(Only for SC candidates)- This round is only for the candidates belonging to SC category. Here candidates from first to last rank will be allocated seat. Additional Round- There is no any kind of surety that this round will be conducted. However incase of availability of seats after completion of all the round, the additional round will be conducted where candidates must register themseleves to attend the counselling process. Dr. A.P.J. Abdul Kalam Technical University, Uttar Pradesh, Lucknow is going to conduct UPSEE Counselling 2018 soon after the declaration of UPSEE results. For more information on UPTU Counselling, keep visiting our website, where you can also get details of Upcoming Engineering Exam Calendar 2018.